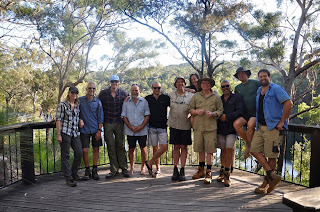 The team from my recent trip to Blue Lake. Rainfall variability in Australia can be extreme from year to year. Large-scale rainfall drivers like the El Niño-Southern Oscillation, Indian Ocean Dipole, and Southern Annular Mode create quite variable conditions across the country due to the ever-changing nature of these systems. The complex nature of, and interactions between, these systems create a distinct challenge in determining how rainfall will vary over a given period in Australia. This variability in rainfall and the changing climate could lead to significant economic, environmental, and water resource issues if not properly understood and addressed. My approach to understanding rainfall variability will be an in-depth study of the lakes of North Stradbroke Island, known locally as ‘Straddie’. Straddie is the second largest sand island in the world. It formed during sea-level high stands in glacial cycles through the last million years. Sands were pushed in and settled on the location of the island, creating dunes. Dune hollows then filled with organic matter, creating an impermeable layer, into which rainfall collected, creating lakes on the island. Over 50 of these lakes now exist, with some histories going back at least 200,000 years. 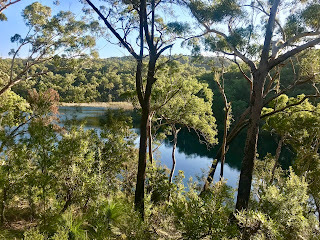 Of particular interest is Blue Lake; a unique lake in Australia because it is particularly resistant to changes in climate through the Holocene (approximately last 12,000 years). Blue Lake is a groundwater ‘window lake,’ meaning it is an expression of the groundwater table at the surface of the island. 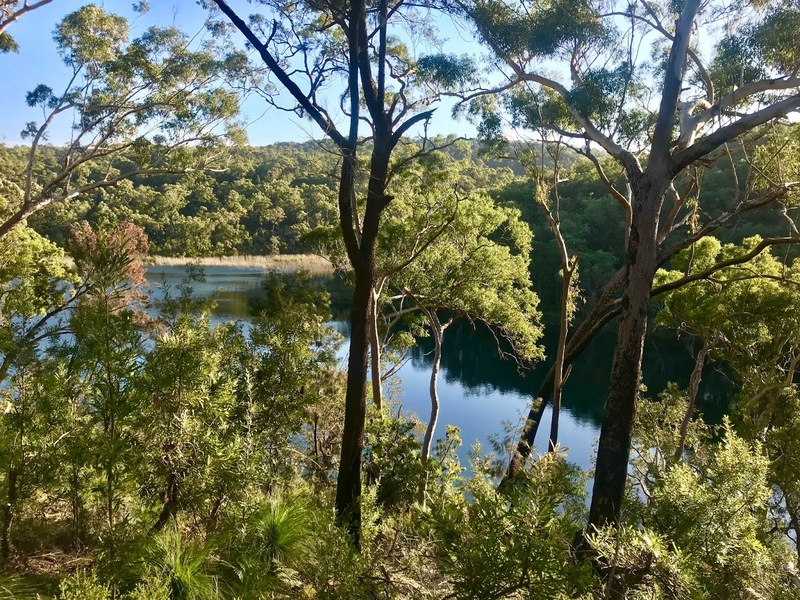 While other lakes on the island are exclusively filled by rainfall and drained by evaporation, Blue Lake is fed by the groundwater table and drains out through a single outflow creek. The utility of Blue Lake is that it is a very stable system, so any change in the lake itself can be inferred as a change in regional climate. With the data from Blue Lake I hope to infer changes in the source of rainfall (and thus air temperatures) from isotope data going back through time. I can then quantitatively reconstruct climate on Straddie through the Holocene and better understand human impact. Ultimately, I will be inferring rainfall source (tropical Pacific or Southern Ocean), which will tell us about the influence of large climate drivers in the past. 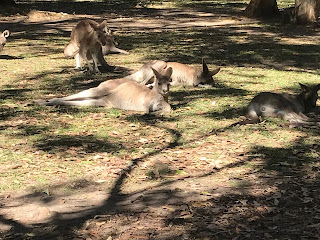 Kangaroos on Straddie lounging about. They're a common sight on the island. This study will have particular importance to traditional owners of Straddie and for understanding Holocene climate variability across Australia. 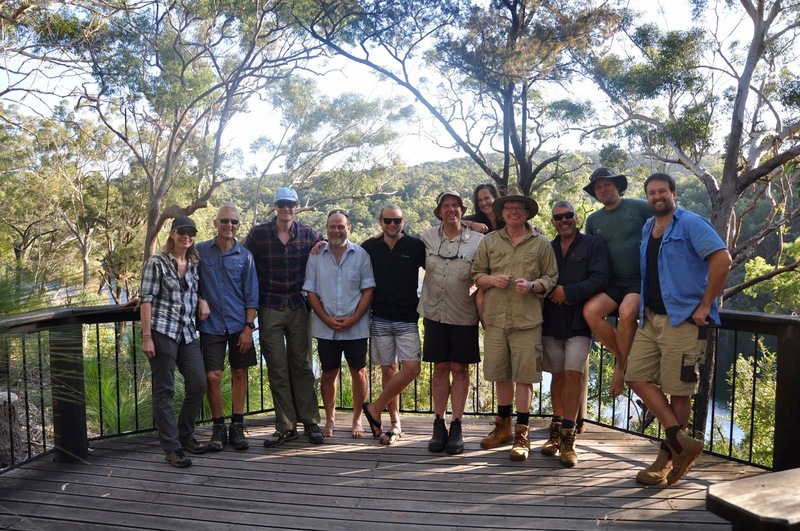 Ecological management will be of utmost importance in the near future to best preserve the unique natural beauty and biodiversity seen in Australia. My hope for this project is to inform the local managers of Straddie (the QYAC; Quandamooka Yoolooburrabee Aboriginal Corporation) of possible outcomes of human induced climate change.